A light and fluffy, cotton candy flavored cake that will make you think you’re at the summer state fair. A few months ago my little brother was trying to come up with new cake flavors for me. 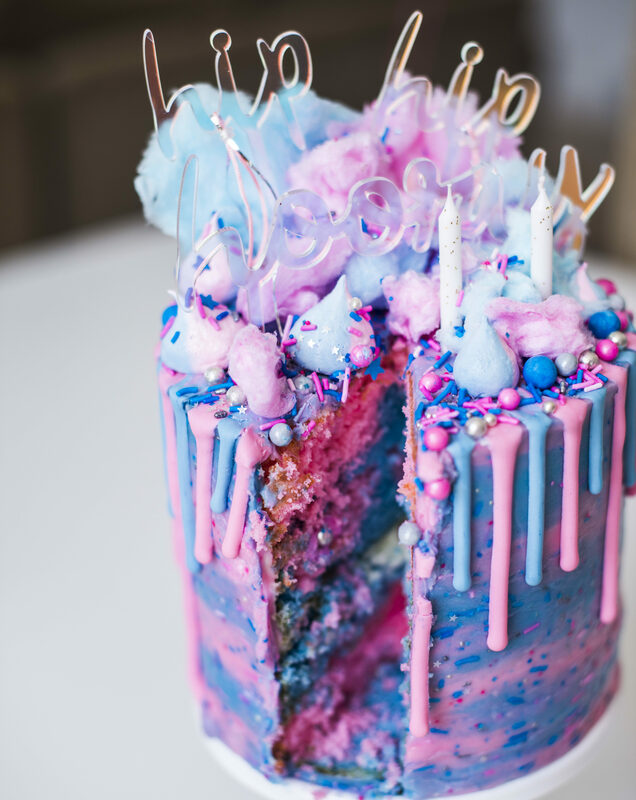 Among his suggestions was a cotton candy cake. It sounded interesting but quite honestly, I wasn’t feeling super excited about it. I set the flavor idea on the back burner and continued working on some other new cakes. 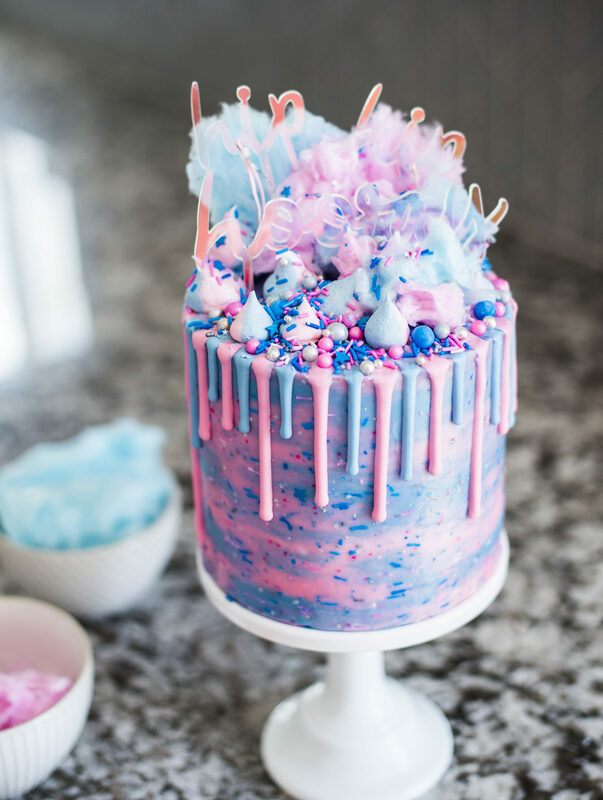 In the meantime, I actually had several more of you request a cotton candy cake. At that point, I thought, ‘alrigtht, I’ve gotta try this out!’. 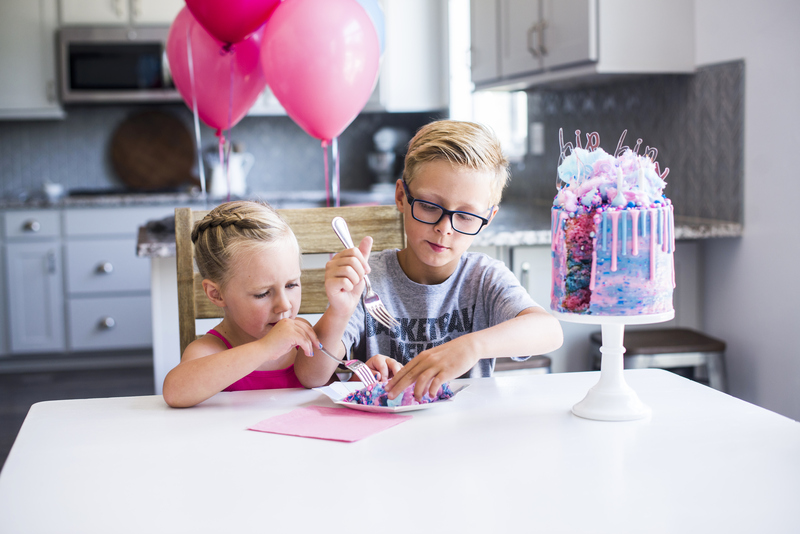 And what better time to give a cotton candy flavored a cake a test run than a kid’s birthday party! I actually had to convince Avery to let me make this cake for her birthday. 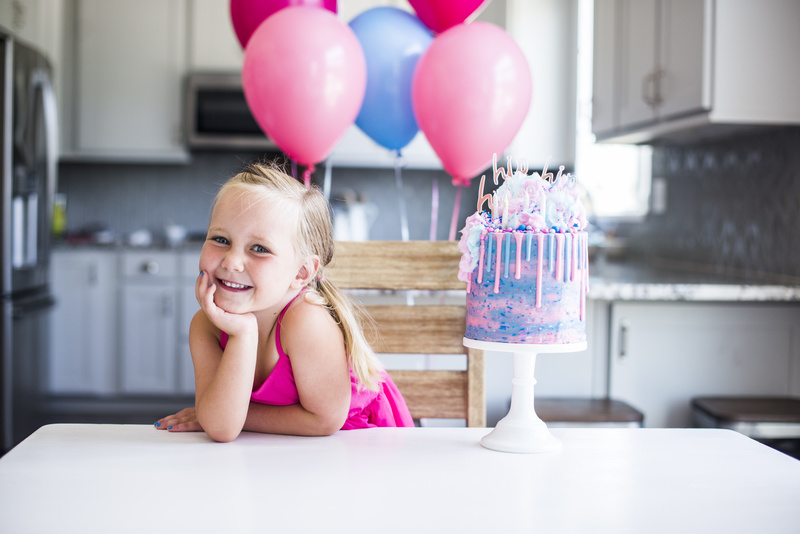 She originally wanted a pink, blue and purple red velvet cake. 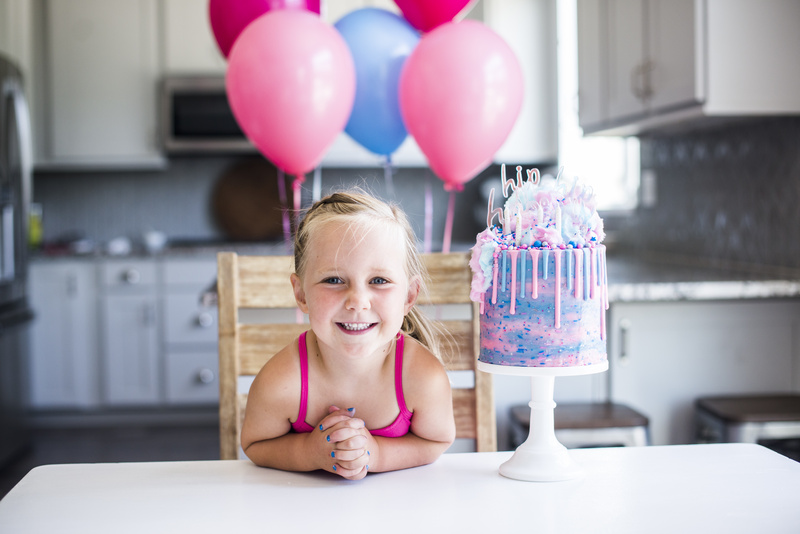 I loved the idea of all her favorite colors on the cake, but having a red velvet cake on the inside just didn’t feel right. Luckily, this girl loves cotton candy (which, might I mention in order to save face a little, she’s only had once. But, of course, it left a lasting impression). 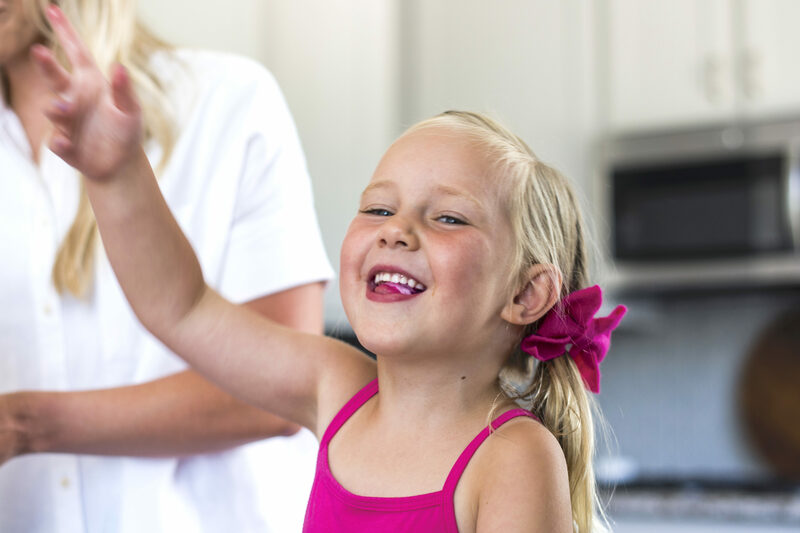 Convincing Avery to switch cake flavors ended up being easy as pie. 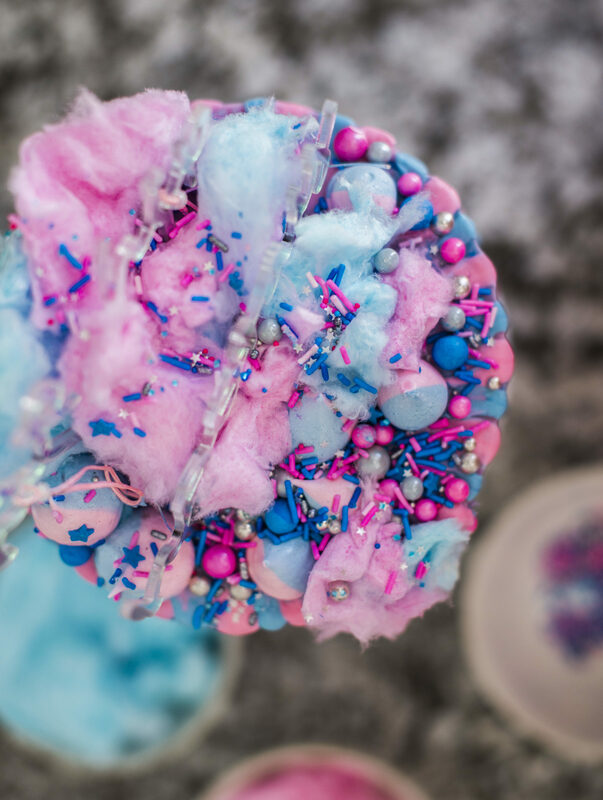 We also decided to throw out the purple and stick with blue and pink to match the cotton candy. For this recipe, I started with the vanilla cake I use for my Funfetti Cake. In my first round, I used Jelly Belly Cotton Candy Syrup. The cake was a little dense and the flavor was barely noticeable after the cake baked, so I decided to give it another go with the Lorann Cotton Candy Flavoring. The second round was a total winner. Avery devoured the cake scraps! I used pink and blue food gel to tint the batter. When you do this, just make sure to gently stir the food gel into the batter. You don’t want to over mix the batter or you’ll find it doesn’t rise as well. I also used the Lorann Cotton Candy Flavoring in the frosting as well. Yes, this cake is sweet, but I can’t imagine it any other way. 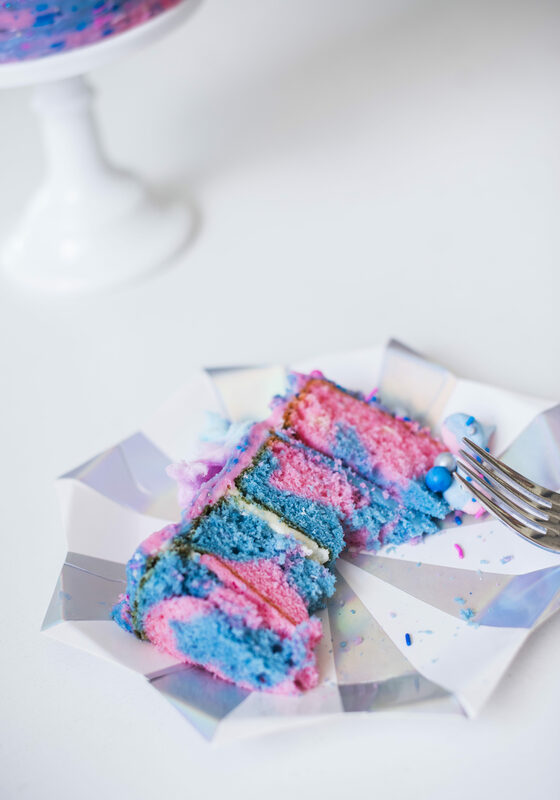 I then dolloped the colors into the cake pans, overlapping each a little so that each slice would have pink and blue in it. 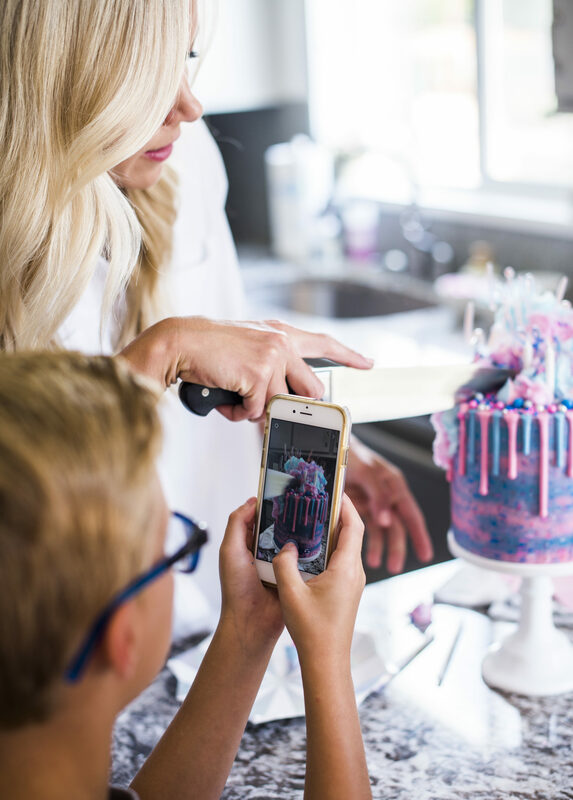 One note about the actual cotton candy – don’t add it to the cake until you’re ready to display the cake. 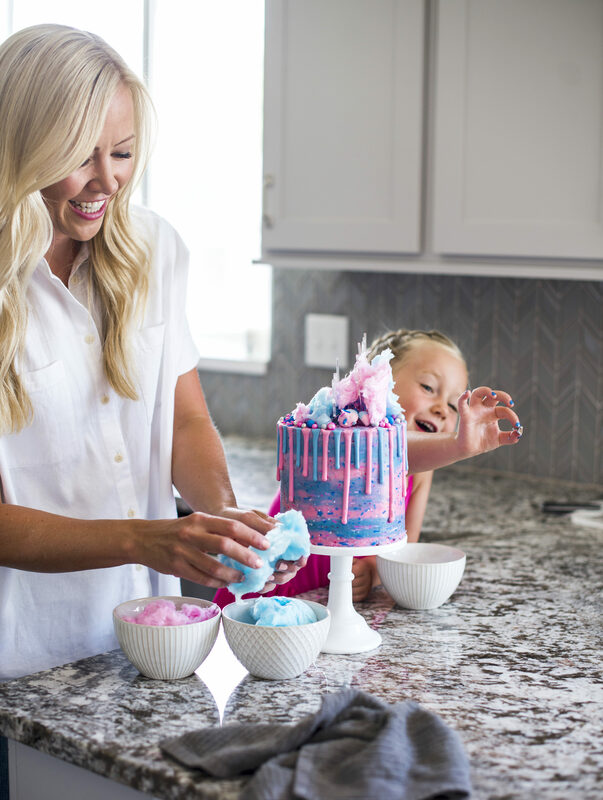 The cotton candy won’t hold up well in the freezer, refrigerator or at room temperature for too long. The kids loved the cake. So much so, they would barely let me get in for a bite! Thank you to Trina Harris Photography for the gorgeous photos. 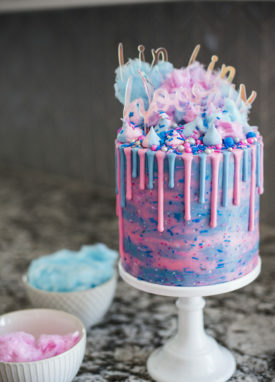 Light and fluffy, cotton candy flavored cake and frosting. Preheat your oven to 350 degrees F. Prepare four 6-inch round cake pans or three 8-inch round cake pans by spraying each pan with non-stick spray, covering the bottom of the pan with parchment paper and spraying the parchment paper with the non-stick spray as well. Set aside. In a medium-sized mixing bowl, combine the whole egg, egg whites and Lorann flavoring. Set aside. In the bowl of a stand mixer fitted with the paddle attachment, combine the cake flour, sugar, baking powder and salt. Mix on low speed for about 30 seconds. With the mixer on low speed, add the butter and buttermilk. Continue to mix on low until just combined and then increase to medium speed and mix for 1-2 minutes, until light and fluffy. Scrape down the sides of the bowl and add the egg mixture in two additions, beating on medium speed for about 20 seconds after each addition until just combined and all the ingredients are thoroughly incorporated. Divide the batter in half. Tint half of the batter pink and half of the batter blue. Stir lightly by hand as to not over mix the batter. Divide the batter into the four 6-inch pans or three 8-inch prepared cake pans, using a kitchen scale to measure equal parts in each pan. (Use about 11 to 12 ounces of batter in each of the four 6-inch pans or 15 to 16 ounces of batter in each of the three 8-inch pans). I dolloped scoops of batter in each pan, overlapping the colors a little, to create a tie-dye look. Bake for 20-23 minutes (my cakes took 20 minutes), or until a toothpick inserted into the center of the cake comes out clean. Let the cakes cool in the pans for 10 minutes and then invert onto wire racks until completely cool. In the bowl of a stand mixer fitted with the paddle attachment, beat the butter on medium speed for about 3 minutes, until the mixture is light and fluffy. With the mixer on low speed, slowly add the powdered sugar, followed by the heavy cream, Lorann flavoring and salt. 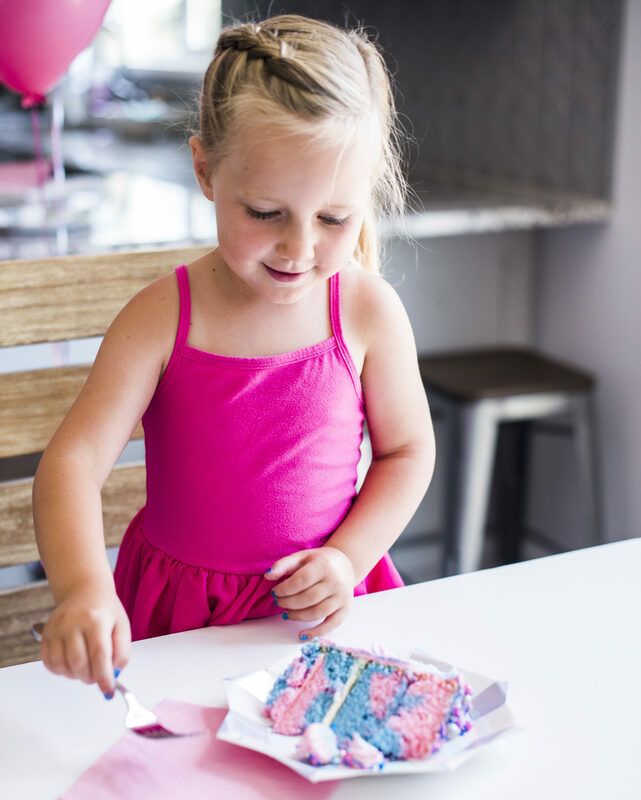 Divide the frosting in half and tint each batch with blue or pink food gel. Stir by hand to push out any air pockets. 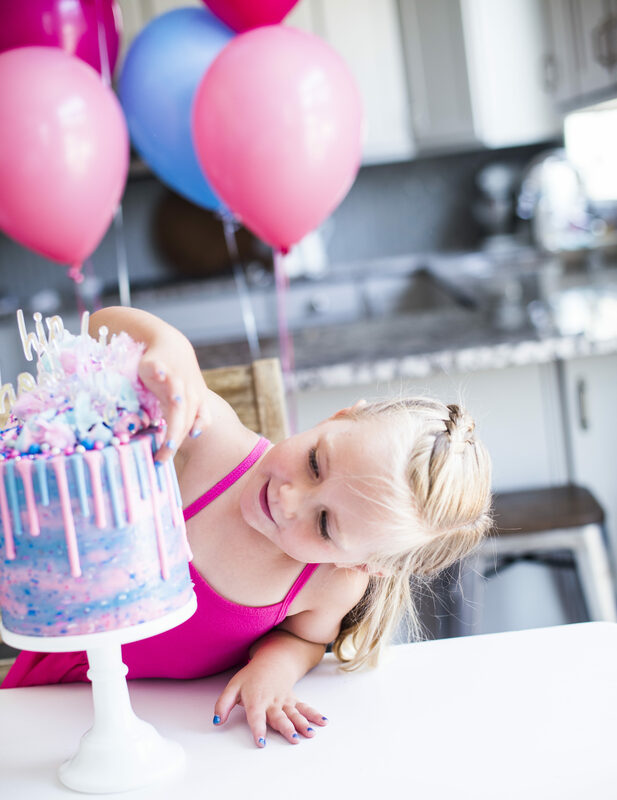 After leveling each of the cake layers with a cake leveler or serrated knife, place the first cake layer, top side up (crumb side up) on a cake board or cake plate. For the 6-inch cake, add about 1/2 cup of frosting on the cake layer. For the 8-inch version, add about 1 cup of frosting. Spread over the cake layer as evenly as possible. Repeat this step until you get to the final cake layer, which you will lay top side down. Apply a thin coat of frosting around the entire cake to lock in the crumbs. Freeze for 10 minutes. After the crumb coat is set, continue frosting and decorating the cake. 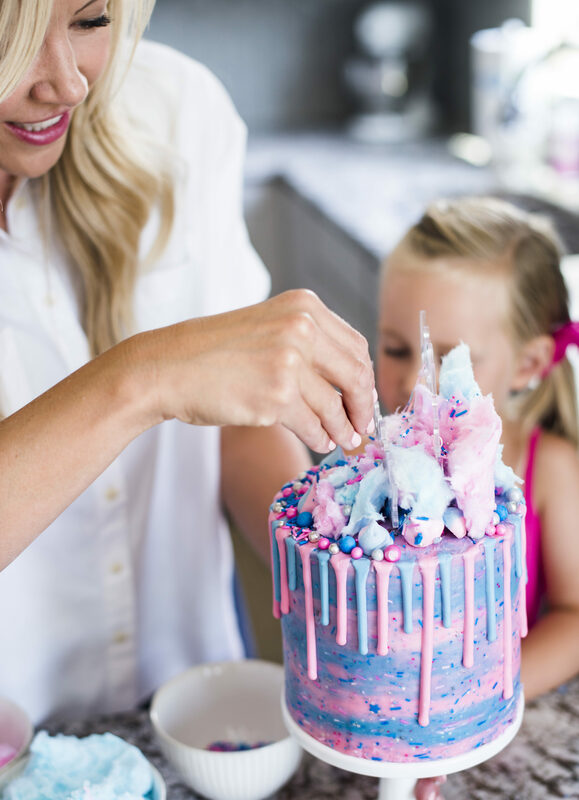 If using cotton candy to decorate, do not add it to the cake until you're ready to display the cake. 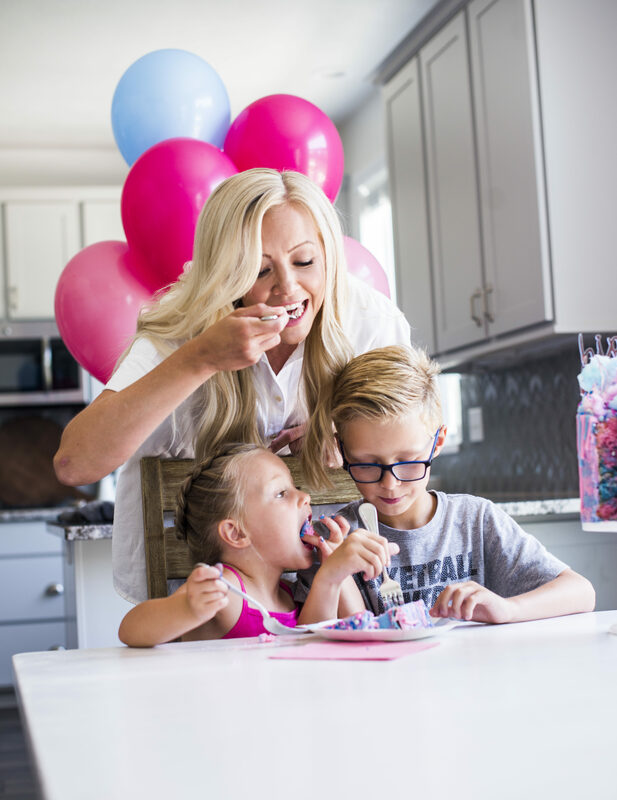 The cotton candy will not hold up in the freezer or refrigerator. This is so beautiful!! Do you have a recipe on the drips? The colors are perfect! It’s 1 cup white baking chips with 1/4 cup heavy cream and just a drop of pink food gel. Looks amazing! is the drip from ganache that you colored?? if so, what recipe do you use for it? Hey! I am going to attempt to make this cake for my daughters bday. I am wondering what you put inside the frosting(sprinkles?) to make it speckled. And if so, what kind? I’m so excited to try this beautiful cake!! Hi! Yay, I’m excited for you to make this. I added Sweetapolita sprinkles to the frosting for the outside. I used her Cosmic Crush mix – https://sweetapolitashop.com/products/cosmic-crush-twinkle-sprinkle-medley. I took out the really big silver balls though. You could also just use pink and blue jimmies. 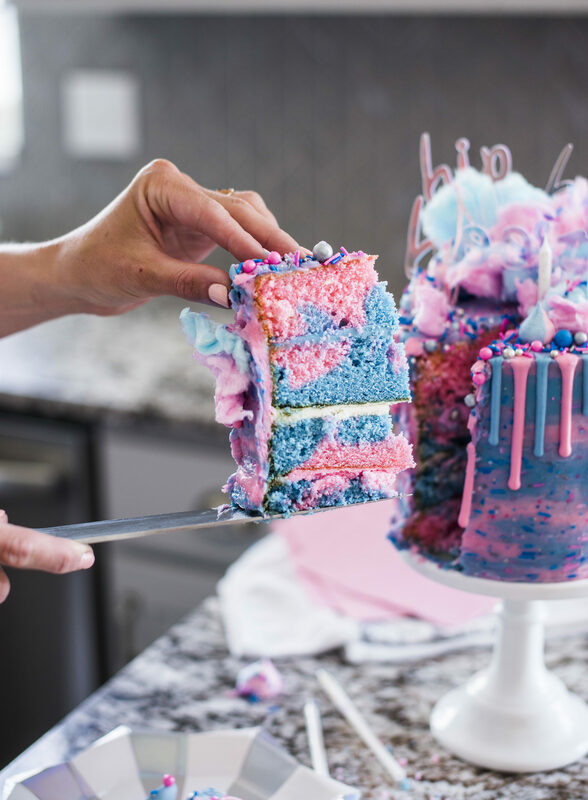 I wondered if you would share the recipe for the pink and blue drizzle that runs down the sides??? Thank you! Never mind! I just figured out how to read other comments. I see the recipe! This cake is very dry! It baked up nice and pretty but the flavor and moisture content are off. I could taste the baking powder in this cake after it had baked. Sorry to say, but I do not recommend this recipe. Susan, I’m so sorry it didn’t work out for you. 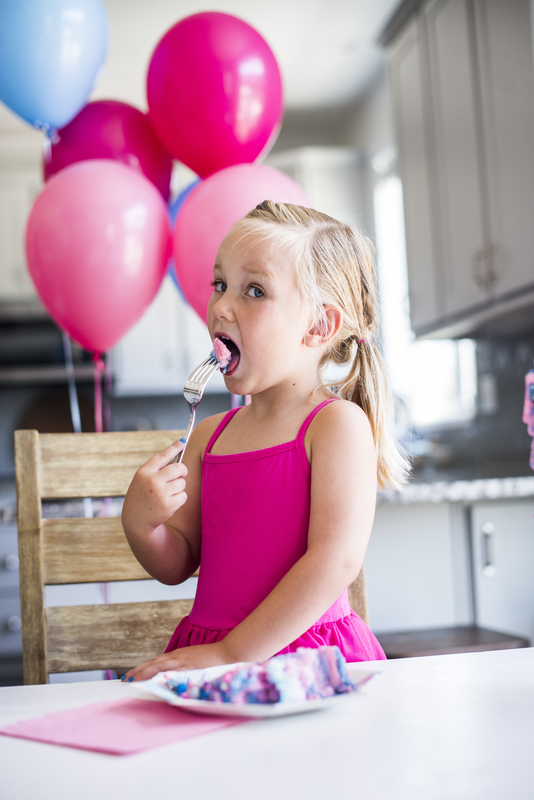 Often cakes come out dry because we overcook them or because we pack too much flour into our measuring spoons. Tasting the baking powder may have happened because it didn’t get mixed in well enough or it was old. This looks so fun! Do you think this would work well doing cupcakes? Any advice? Honestly, I’m not sure. I’ve never tried this as cupcakes. I’ve heard it works from others though. Gorgeous cake! How do you make the drip? Yes I added the sprinkles to the frosting. I just used piping bags to randomly place the frosting and then scraped to blend them.